2908 ENT JAPAN (1899) Geisha dance*. 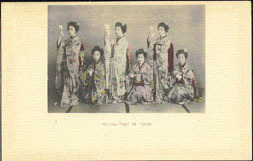 1-1/2 sen postal card (N) with color photo on front of Geisha-Tanz in Tokio. 9730 ENT JAPAN (1912) Rooster*. Pig*. Cow*. Ram*. Postal card (N) with illustrated cancel, agricultural theme. Nice! 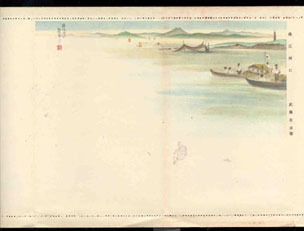 11177 ENT JAPAN (Occupation of Manchuria) (1936) Harbor scene*. Multicolor illustrated free frank (N) letter card. 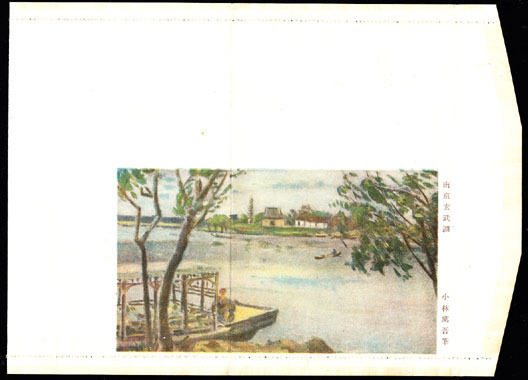 17191 ENT JAPAN (OCCUPATION OF MANCHURIA) (1936) Houseboat on river. Multicolor illustrated free frank (N) letter card. 9656 ENT JAPAN (1957) Origami bird*. 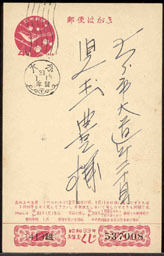 Postal card (N) in red printed with lottery information at bottom for New Years Lottery. Interesting! 9657 ENT JAPAN (1958) Bird*. 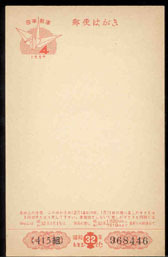 Postal card (O) in maroon printed with lottery information at bottom for New Years Lottery. Interesting! 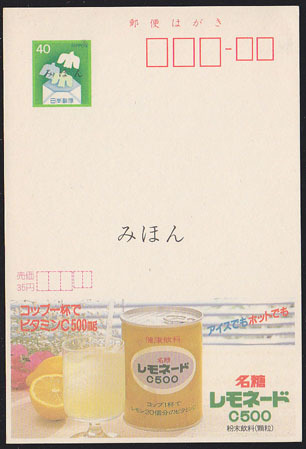 10945 ENT JAPAN (1962) Lemon drink. 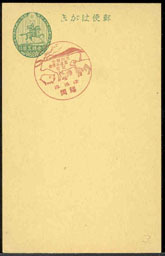 Illustrated postal card (N) overprinted MIHON (specimen).